In this session Lindsay will discuss the Top 5 Innovations, Top 5 Design Mistakes, Top 5 Business Struggles and Top Tactics for Working in Male Dominated Environments. Co-owner of Ecological Design, certified Permaculture Designer and ecological consultant, Lindsay Rebhan is passionate about seeing the land alive with life, employment, learning and nourishment. A specialist in agroecology, land design and land management, Lindsay works with farmers, food nonprofits and organizations to increase the ecological, human, animal and economic wealth of land over time. A graduate of Environmental Studies at the University of St. Thomas, Lindsay studied food systems and culture in Bangladesh, Cuba and Guatemala. She is a former Program Director at Permaculture Research Institute Cold Climate, a Program Coordinator at Renewing the Countryside and a speaker on land regeneration issues. This session will cover practical examples of how to create community impact on a major scale from the bottom up, and a step-by-step guide for implementing the 8 forms of capital, zone/sector analysis, and S.W.O.T analysis to create abundance out of scarcity. Jonathan Dodd is the founder and executive director of Keipos, a nonprofit focused on food, farming, and education. Keipos offers 12-week internships and PDC courses, and also provides garden programming for at-risk youth in a local youth detention center as well as at a YMCA summer garden camp, along with other education opportunities for their community. Through his work with Keipos, Jonathan has established 5 garden sites on donated public and private land in Papillion, NE, growing literally tons of food for families in need and volunteers. Keipos started in response to rural needs in Nicaragua, where they have helped with the issues of water, sanitation, appropriate technologies, and community involvement. Jonathan has worked in this area of Nicaragua part-time for the past 8 years. Jonathan is also the owner of New Earth Farm & Goods, a 5-acre polyculture farm that boasts diversified perennials, fungi, and multispecies grazing. He has taken root and planted in Papillion, NE for the past 6 years, alongside his spouse and three children. New Earth Farm & Goods is the home and heart of Keipos, Inc.
Have you ever wondered how healthy your soil is? Does it have the correct ratio and diversity of microorganisms for the plants you are growing? Understanding the answers to these questions will increase plant yield, build soil structure, suppress disease, retain and recycle nutrients, decompose toxins, and reduce water usage. You are invited to learn about the foundation of the soil food web in this session. Carol Christensen resides in Madison Wisconsin and is an active member of the Madison Area Permaculture Guild as well as a recent student of the well know soil scientist, Elaine Ingham. She offers consultation services that help her clients analyze their soil and develop written reports detailing the ratios of soils microorganisms - good and bad. Based on this information she helps design custom compost, compost tea, and or compost extracts to provide her client's plants, shrubs, and trees with the essential microorganisms for optimal health and yield. Carol Christensen: MS (Adult Continuing Education), BA (Physical Geography), University of WI-Madison; Soil Life Student with Elaine Ingham, PhD; Permaculture Design Certificate; WI Master Naturalist. In this session we will explore our ancestoral roots from Otzi and the tinder conk mushroom to the Roman Bathhouses all the way to the advent of Rocket Stoves while making many stops in between. Come fuel your inner pyromaniac and step back into a personal relationship with your BTU consumption. Jim Schalles is the Founder of Tallgrass Vernacular. After receiving his B.S. degree for Environmental Sciences in his hometown of Omaha, Nebraska, he traveled through Patagonia where he became enamored with Natural Building in the town of El Bolson, Argentina. Upon returning to the United States, he headed out for Oregon where he began his education at Aprovecho School of Permaculture, earning his PDC while simultaneously taking an in depth natural building practicum. He has taken various natural building classes and workshops up and down the West Coast of the U.S. and began his own building career by practicing with Cob Ovens which has turned into a passion of wood-fired devices. He is now a member of the Masonry Heater Association of North America and is well versed in numerous natural building techniques. His hope is to start a School of Natural Building for the Great Plains in the Loess Hills of Western Iowa were he, his partner Ashe and their great dane Adobe live. The dream is to one day have a baby bison grazing on his Tallgrass Prairie planted living roof. Learn 4 simple but profound tools for creating a more meaningful experience together in nature. Heidi Huebner is owner and steward at Bluebird Hill Homestead, an off-grid venue for nature connection classes for kids and adults. She is a homeschooling mom, an artist, author, nature mentor and healer. Research based methods for encouraging children to connect with nature. How to encourage observation skills and a deeper understanding of the natural world. Andrea Fourness is an educator and co-owner of Deciduous Learning Network, an organization dedicated to connecting people to nature. She has been involved in environmental education for over 10 years. She stumbled upon Permaculture a few years ago and instantly felt connected to the philosophy and practice. She continues to be inspired to get more young people interested in sustainable ways to care for the earth. She believes mentoring youth and helping them foster a connection to nature is the start to get them to be budding permaculturalists. She continues to research the best ways to get youth involved and runs programs in the Madison area to put her research into practice. This session will be an introduction to the technologies and workflows involved in creating realistic and accurate 3D models of your permaculture designs. Session will explore how 3D models are developed in Trimble SketchUp with data from drone-based surveys, GIS, and on-site measurements. .
Jim received his B.S. in environmental engineering from the University of Wisconsin - Platteville in 2005. Afterwards he adventured across the country in search of experiential learning in the realms of permaculture, intentional community, natural building, and alternative energy. He has worked as a riparian zone habitat technician, built homes, stomped cob, erected meteorological towers, and performed two terms of service with AmeriCorps. In 2014 Jim founded Harrier Geographics LLC, a small business specializing in 3D property modeling, mapping, and drone imagery. Much of Jim's work takes place in the field of eminent domain law where he is hired as an expert witness to illustrate the impact of highway and transmission line projects. On occasion he assists those in the permaculture and regenerative agriculture community by creating site plans, contour maps, and 3D models. Jim enjoys long walks on Wisconsin River sandbars, white-knuckled motorcycle adventures, and lives in Dodgeville, WI with his dog Casey. Children and adults will join Emily in this hands-on session covering the ins and outs of planting trees, shrubs and herbaceous plants. Emily will share tips and tricks she has learned while everyone gets their hands dirty. 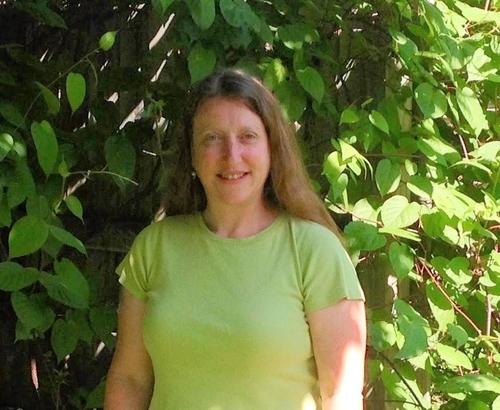 Emily has been an environmental educator since 2002 and an avid gardener since 2005. Emily started pursuing her edible landscaping business idea in 2011 and planted over 200 trees in 2015. In addition to her business, Emily Plants, she works at Aldo Leopold Nature Center in Monona, WI, educating children about the natural world. She also works at Blooming Grove Preschool and Door Creek Orchard. Emily and her husband, Greg Dixon, maintain two apple trees in their yard, along with two cherry trees, a plum tree, three blueberries, three gooseberries, two honeyberries, strawberries, and four serviceberry (juneberry) plants. All of these food plants, plus native plantings, an asparagus patch, and a vegetable garden fit comfortably in their backyard in Madison, WI, providing organic food throughout the year. Emily earned her Permaculture Design Certificate in 2015 from the Madison Area Permaculture Guild. This talk will go through a list of helpful strategies and techniques for starting up a permaculture farm from scratch. 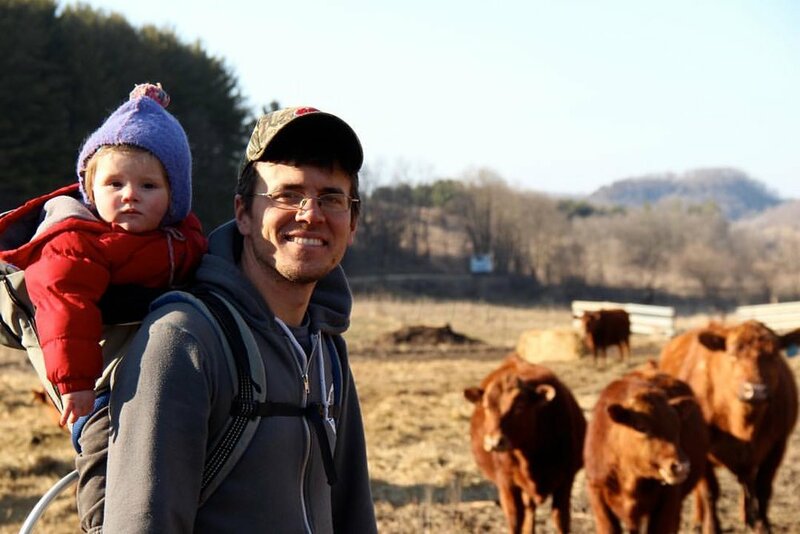 Peter is an ecologist turned farmer who started Mastodon Valley Farm in Southwest Wisconsin where he and his family have built an off-grid homestead and raise pastured beef, lamb, pork, and poultry that they sell direct through their meat CSA. He teaches courses on regenerative agriculture and helps beginning farmers establish profitable regenerative agricultural systems. Peter brings his ecological background to his farming practice. He spent a decade at UW-Madison, teaching courses in ecology and complex systems theory, and researching the history and functioning of Midwestern ecosystems. He realized the critical role that animals play in the creation and maintenance of functional ecosystems. Peter realized that in order to achieve broad-scale ecological restoration, it must be an economical viable pursuit..
Root Down Reach Up Yoga is a yoga program designed with the unique lifestyle of growers in mind. Owning a permaculture business (or any type of business!) is emotionally & financially stressful, physically demanding, and can encompass one’s entire life. Improving our physical & mental well-being, will ultimately strengthen the sustainability movement from the inside out. Anne has been digging in dirt on organic vegetable farms in the Madison, WI area since 2007, and started her own organic vegetable farm (regenerativeroots.com) at Wild Abundance Community Farm (WACF) in 2012. This spring, she left as a business partner at Regenerative Roots, and is beginning a new chapter weaving part-time farming, teaching yoga, making art, and coordinating the Fort Atkinson Farmers’ Market. In 2017, Anne completed a 200-hour yoga teacher training with Alignment Yoga in Madison, WI, out of an interest in balancing self-care practices that nurture resilience for the long haul. She’s learned that it feels good to have tools for self-study and ideas about how to subtly train her body to be more balanced over time. Training on the yoga mat transfers to wise use of the body during strenuous farm projects. Yoga has increased her quality of life, reduced stress levels, and contributed to a less achy body. The permaculture Zone 5 is in trouble. Many plants are disappearing from our landscape. Learn to assess and raise the carrying capacity of your woodland and prairie resource. In this session you'll learn the ins and outs of keeping worms as part of your compost system. This method is especially helpful here in Wisconsin, where outdoor composting is difficult in the winter months. Scott is the founder and director of the Low Technology Institute just south of Madison, Wisconsin where he researches strategies for people and communities to become self-sustaining in a post-fossil-fuel world. The Low Technology Institute offers classes on topics related to housing, clothing, and feeding ourselves without fossil fuels. Scott holds a Ph.D. in archaeology and combines this academic rigor with a lifetime of tinkering, inventing, and constructing. Putting food up with fermentation helps you to preserve your bounty with little energy input, while adding beneficial bacteria, vitamins and flavor. In this session, you will learn how to make various fermented foods that you could easily make at home. Laura Poe is a dietitian in private practice in Viroqua, WI, where she specializes in individualized healing with traditional, whole foods. Originally from Missouri, she has been braving the Wisconsin cold for 4 years. Along with her practice, she is an avid fermentation fan, and integrates these foods into her practice as much as possible. She teaches classes and workshops on nutrition and traditional foods preparation all over the region, and is a contributing writer for Edible Madison. You've got your PDC, Now What? Gaining confidence in your design, installation, and business skills to grow a successful permaculture landscape business. This includes the basics of setting up a business in the Great Lakes region. Pete is a landscape architect and permaculture designer, based in the twin cities, MN. He has helped build landscape design-build firms, and also has his own design business Artisan Environments, LLC. Those attending this workshop will take part in the journey of the 7000 sq foot Riverside Middle School Garden (RMSG) in Watertown, WI, which includes a 16’x32’ hoop greenhouse, 10’x20’ pergola that serves as an outdoor classroom, 8’x12’ utility shed and an 1150 gallon roof water collection system. Using an extensive assemblage of candid photographs and stories from RMSG, Peter will walk through, step-by-step, the process of planning, installing, growing, and maintaining a successful – and nutritiously delicious – school/ community garden. Peter Watts of Watertown, WI has been a science educator for over 30 years. 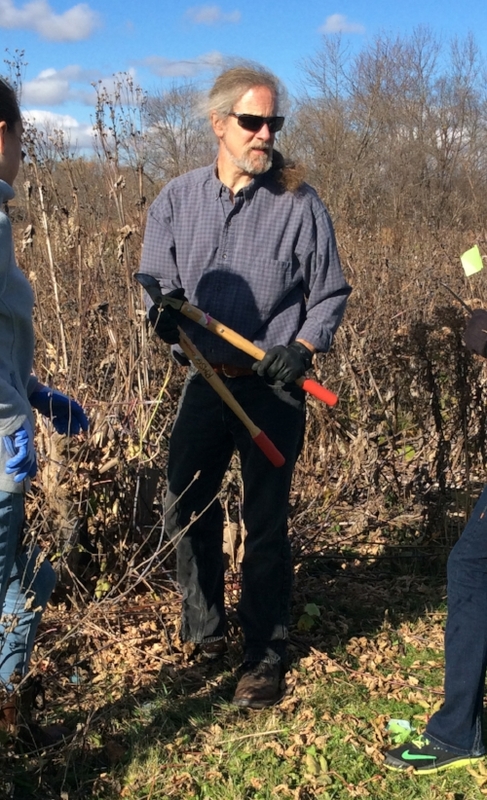 Among his accomplishments in the area of environmental activism are prairie restorations, annual river clean-ups and storm drain stenciling, implementation of the 7,000 square foot Riverside Middle School Garden (RMSG) located in Watertown, Wisconsin, as well as other environmental and permaculture projects in his community. Over the past 3 decades Peter has proven to be a successful grant writer, having written or assisted with writing awards totaling well over $500,000. He has also consulted on projects ranging from curriculum writing to ethical land use. Residential photovoltaic (PV) solar panels are surprisingly affordable. Electric cars (EV) are remarkably fun to drive and there are more and more to choose from. And time of use (TOU) electric metering can help you pay off the panels faster and make it much cheaper to charge an electric vehicle. Let's talk about how PV, EV and TOU could fit into your sustainable life with a real-life example, numbers to back it up and maybe a test ride? Josh Feyen has always been a farmer. Raised on one in Wisconsin's driftless area, he's now an urban farmer in Madison, cultivating a butterfly waystation in the terrace, growing fruit in his front yard, raising chickens with his neighbors on one side of his house and a kitchen garden on the other, and producing food in hugelculture and traditional raised garden beds in the back. With solar panels on the house, an electric car in the garage and community living inside the house, Josh tries to include a sustainable component to all aspects of living on Earth. Josh co-organizes a community garden, is interested in Madison's local food system and is keenly watching the Madison Public Market development, soon to be located just down the street from his family's home. 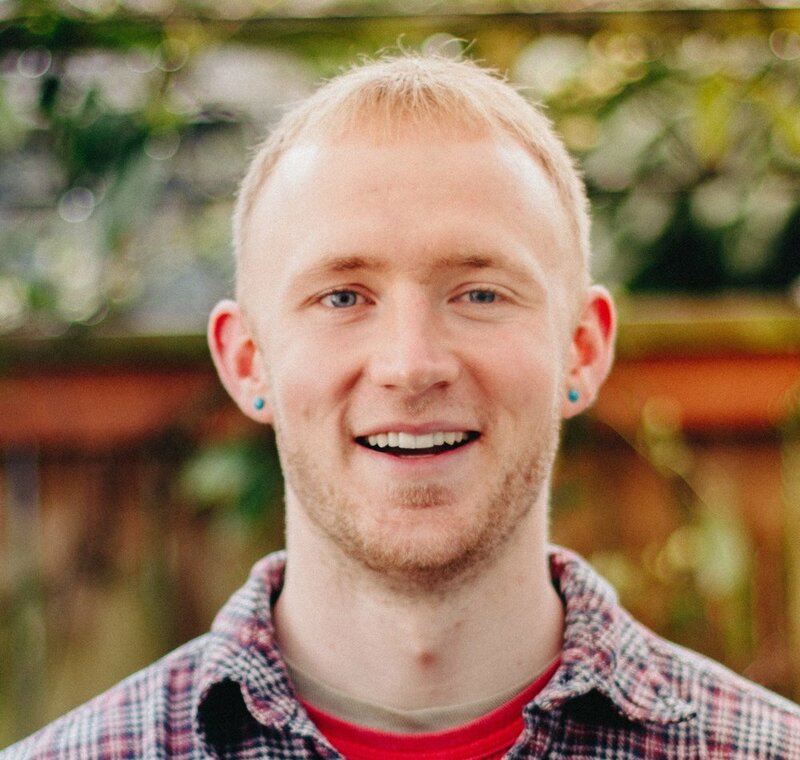 Josh earned his permaculture design certificate in 2013, is currently a graduate student in the Edgewood College Sustainability Leadership Master's Program and is part of the 2018 Wisconsin Permaculture Convergence organizing team. Urban Permaculture is often an end of the PDC course module, and rarely is the entire focus of study. In reality, most of us live in urban environments and our permaculture should reflect that. We'll observe our place in our local ecologies, and interact with the Possible City through the framework of Permaculture. Rob Czernik has been facilitating an Urban based PDC for the last 3 years in Minneapolis. He'll share some observations and ask alot of questions! Rob has been involved in urban farming in Minneapolis for over decade. He graduated from PRI-Cold Climate’s inaugural Urban Farmer Certification in 2012, and earned his most recent PDC in 2013. Rob has studied Permaculture Teaching with Jude Hobbs and PINA, and facilitated an Urban PDC course for 3 years. As a Lead Course Facilitator, he brings a diverse and eclectic mix of instructors and classroom sites to the Urban PDC course, and focuses on the intersectionality of food and social change. Rob is also the owner of Powderhorn Feed Co., which provides whole grain feed and education to urban chicken keepers. He has mentored under Dan Halsey, and his influences include the work of Pandora Thomas, Rosemary Murrow, Jude Hobbs, and David Holmgren. Even if you don't own your own land, there are free medicinal plants all around us. Learn what plants to look for, how to process and store them and some basics on how to use the plants for health and wellness.